Robot waiters and robot receptionists serve patrons in the "Continental Robot Experience Pavillion" in the suburbs of Jinan, the capital of Shandong Province. The restaurant is running a buffet hotpot business and uses six robots to serve its customers. Currently, the 500-squarere-meter restaurant can admit nearly 100 people dining here at the same time. 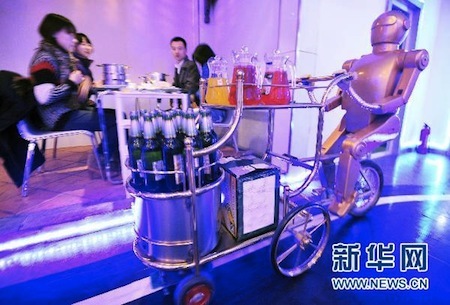 Located in the suburbs of Jinan, the restaurant also has a special name, "Continental Robot Experience Pavilion," which sounds more like a robot exhibition hall than a restaurant. Looking at its big French window, customers see more than 10 posters of robots and also can hear the music from the restaurant. They stop near dining tables and let customers order dishes and drinks themselves before moving to the next table. The six robot waiters can take care of 21 tables and about 100 customers at the same period of time. A person in charge of the restaurant said the ordering and delivering work were mainly finished by robots waiters, and they only hired a few real people to be administrators and guides. The work in the kitchen still requires real people. He said that every robot was installed with a sensing system, so it would stop automatically when it feels something is in front of it. 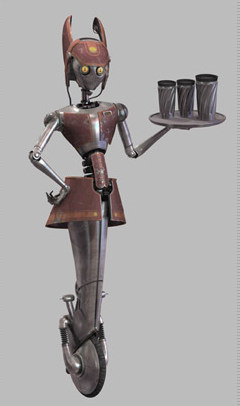 Science fiction readers are long familiar with robot waiters; as I recall, R2D2 served as a robotic waiter on Jabba's sailbarge, and of course the waitress WA-7 from Star Wars II Attack of the Clones. The Continental Robot Experience Pavillion is not a true robotic restaurant, since the food is prepared by human beings and there are a few human guides for confused customers. Take a look at this video of the Robotic FuA-Men Fully Automated Ramen Restaurant in Nagoya, Japan. Don't miss this video of robot waiters in Thailand and the South Korean FURO robot waiter.